Dressed in a flight suit,sitting behind the controls of a miniature airplane with a thumb up, this customized bobblehead doll is an Air Force pilot. Are you a pilot? Do you dream to fly in the air like a bird? Or are you the model planes' fever? If so, it's really worthy to have a miniyou seated on this tiny sculpted airplane. 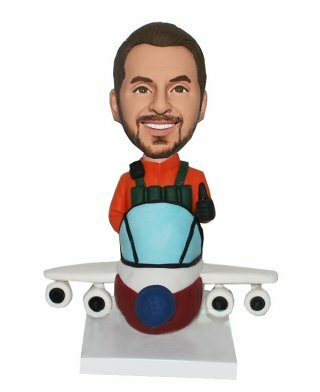 This is the custom pilot bobblehead doll.